Urgent care San Fernando Valley residents have come to expect is often less than efficient in getting patients in and out of the healthcare clinic quickly, and it takes valuable time away from their day which could be spent resting at home. Luckily, urgent care in San Fernando Valley doesn't have to mean waiting endlessly for the doctor, only to get a pithy 15 minutes of his time. With House Call Doctor Los Angeles, San Fernando Valley patients can get the personalized care and attention they want without even having to leave their home, hotel or worksite - wherever they are requesting treatment. 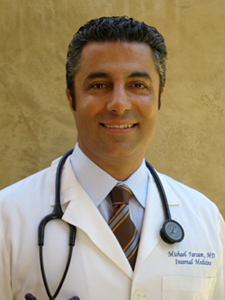 House Call Doctor Los Angeles is run by board-certified internist Dr. Michael Farzam, a trusted practitioner and mobile doctor, providing care throughout the Greater Los Angeles area to his patients. While it may seem like the era of doctor house calls is past, Dr. Farzam still very much practices that very thing in the modern day and age. In fact, he also has a retainer service for patients who want more than just urgent care visits, for those who want regular healthcare appointments for virtually any ailment they may have (expect those which require a 911 call). Urgent care San Fernando Valley residents can call for is readily available through House Call Doctor Los Angeles, where Dr. Farzam will gladly provide the medical attention you need for any injury or ailment you may have. Urgent care in San Fernando Valley is just a phone call away, so if you need immediate medical attention and don't want to leave the comfort and privacy of your own home, make the call to House Call Doctor Los Angeles today at 310-849-7991!